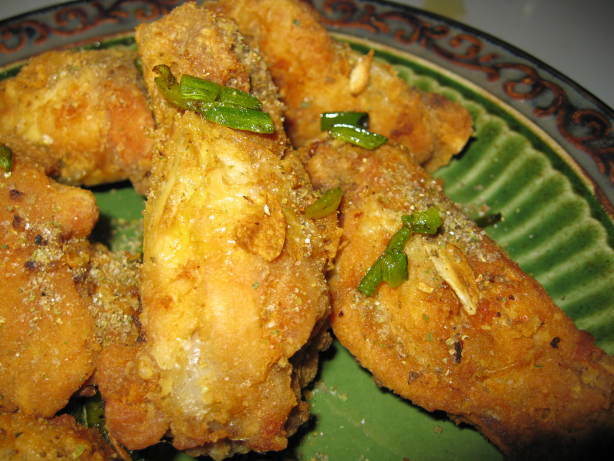 This is a recipe for crispy chicken wings, flavored with toasted salt and pepper, garlic, and hot peppers. The recipe is best with dried Sichuan peppercorns, but since they are hard to come by, use whatever you have. In a small dry skillet, toast salt and peppercorns until the salt is slightly browned and the peppercorns are fragrant, about 10 minutes. Remove from heat and let them cool; grind. Combine 1 teaspoon of the salt and pepper mixture with the flour and dredge the chicken pieces in it to coat. Deep fry the chicken at 350°F, in batches, until golden brown, 8 to 10 minutes. Drain on paper toweling and season with more of the salt and pepper mixture. Heat 1 tablespoon of the frying oil in a skillet, over medium heat, and cook the garlic until golden, about 2 minutes. Add the serrano chili slices and cook them until they are tender crisp, about 2 minutes. Sprinkle over the chicken along with any remaining salt and pepper. This entry was posted in East Asia, People's Republic of China and tagged Asian wings, chicken, chicken wings, China, Chinese cuisine, fried chicken, fried chicken wings. Bookmark the permalink.